This film had all the signs of being an instant classic. 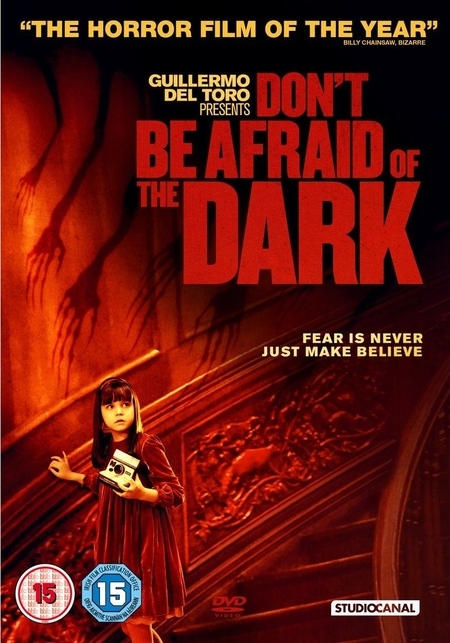 Good cast, eye-catching case and the pedigree of Guillermo Del Toro as producer and co-writer. In reality what we have is a sub-standard remake that delivers very little on its promise of “Horror film of the year”. Thank you very much Billy Chainsaw of Bizarre magazine but I’m sorry, you let me down! In brief, Sally (Bailee Madison) is sent to live with her father Alex and his girlfriend Kim (Guy Pearce & Katie Holmes) Alex is an architect and Kim is an interior decorator, together they are living in and restoring Blackwood Manor... The house, is supposed to be set in Rhode Island despite it being unlike anything you may find in Rhode Island! It is creepy enough and as the film’s opening shows us, it has history. The opening sequence involves Lord Blackwood, a house keeper and a hammer and chisel. It actually provides us with the first and unfortunately last squeamish moment. As Sally gets used to her new surroundings, she inadvertently releases an evil of sorts, one which could potentially cause terror and mischief in equal proportions. While my initial optimism of this film didn’t dissipate until towards the conclusion, I was somewhat disappointed to discover that what I had assumed to be a haunted house movie with potential turned into a kids’ fairytale with an adult’s only sticker! Harsh? Possibly but all I could think about once I had learned this truth was why doesn’t someone just pick up a golf/cricket/tennis racket/bat/club or even just start kicking, they’re 6 inches tall for god’s sake! The creatures although massively de-horrified once you actually get a good look at them were rather well designed and the atmosphere in the early stages of the film plays like a haunted house film and as such was quite pleasing. Guy Pearce has a fairly proven track record but every now and then he makes you think, why? If the Australia connection is correct, then I would think he owed someone a favour. Katie Holmes was acceptable as Kim and played a big part in the development of the film even if the dialogue between the cast was somewhat stunted and unrealistic. This leads on to the chemistry, as the script was bad to terrible, there was no real connection between the two adult leads and the on-screen development was non-existent, that’s not to say they were bad, far from it but they didn’t have a lot to work with. Looking at the cast as a whole, the best display came from little Bailee Madison who plays Sally. Some of her pained expressions made me feel as though she really was terrified and the misses just wanted to give her a hug!